Find out all about the incredible youngsters involved in Music at the Heart of Teesdale M@HoT in this fascinating article which also pays tribute to our very own Mike Bettison! Project co-ordinator for Music at the Heart of Teesdale, Neil Diment, introduces the venture for young musicians he co-founded in the North East – which he believes is replicable elsewhere in the country. When my two young children and I moved to Barnard Castle in County Durham 15 years ago, it seemed as if folk music in Teesdale was dead, or at best well-hidden – most people of my generation were no longer interested. My kids both played fiddle and I wanted them to have an opportunity to participate in live music. I wondered whether we should skip my generation and set up a group for young musicians in the area. A chance conversation with Teesdale musician Mike Bettison (of The Salami Brothers) sparked a fledgling idea for a project to revive local folk music, song and dance traditions with young people. My background was in environmental education and conservation, and when I saw a call from the landscape partnership project, Heart of Teesdale the Heritage Lottery Fund) for community projects with a focus on cultural heritage, Music at the Heart of Teesdale (aka M@HoT) was born. In 2011, we secured funding for three years. Our aims were to support a programme of research by Mike into local folk music traditions; to form a youth folk band – Cream Tees – to play some of those tunes; and, in the third year, to challenge the young musicians to produce a new piece of music inspired by the landscapes of Teesdale. So how is it that a non-musician such as myself has been able to help set up and run a youth folk music project? From the start, M@HoT looked to others for advice and support. The local secondary school and Durham Music Service recognised the opportunities we could provide for their students, and offered their whole-hearted support – not least by encouraging their own young musicians to join us. Our core funding enabled us to bring in a wonderful musician and tutor, Hinny Pawsey, to lead two workshops a term, but we struggled to transform this initial momentum into weekly sessions. We approached Newcastle University’s folk degree course which has led to a successful partnership: final year folk students now run a session at M@HoT every other week, gaining valuable teaching experience. M@HoT’s third year of funding was celebrated with the premiere of Rooted – A Teesdale Suite, a piece of music composed by Cream Tees with tutors Sophy Ball and Ian Stephenson. This was performed at community arts venue The Witham in Barnard Castle. Cream Tees has since grown in skills and confidence, drawing on Mike’s research, which developed into an archive of more than 80 local folk tunes (available on M@HoT’s website). Further research uncovered records of longsword dancing thriving in Teesdale and South Durham in the 19th century and up to the First World War. With the help of Spen Valley longsword dancer Patrick Langdon – who had retired to the Teesdale village of Gainford, expecting his 30 years of dancing were over – we revived this tradition in four local primary schools. We also work in Teesdale School, providing workshops for all Year 7 children and an annual inter-house longsword competition. 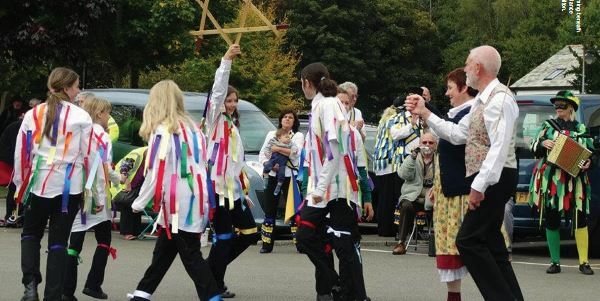 The Teesdale School team has danced at national Sword Dance Union events and has also helped revive the maypole dance tradition in the Teesdale village of Ovington. This summer, the longsword team from Gainford Primary School recreated a historic event on the village green. They danced to a tune recorded by the local vicar’s daughter in Victorian times, which was played by a young Cream Tees musician on a donated flutina (a type of squeeze box favoured by the Teesdale quarrymen of old). We are planning a Day of Dance with local schools in Barnard Castle in May 2018, and will invite other longsword youth teams in the region to take part. When the core funding ended, we introduced termly fees for Cream Tees, and with income from regular performances and busking, this just about covers our weekly sessions. Mike’s partner Rosie Cross, of folk band Pyewackett, secured outside funds to offer workshops with professional tutors; to support a First World War project with John Kirkpatrick led by volunteer tutor Rupert Philbrick; and to take the youngsters to perform at festivals. A successful bid to the Arts Council’s Grants for All scheme has enabled us to develop further, and offer workshops with Sam Pirt of The Hut People and Sandra Kerr, recently retired director of Newcastle’s folk degree course. None of this would be possible without the help and hard work of parents and volunteers providing transport, seeking new funding and offering enthusiastic support. As M@HoT has become established, we have also enjoyed support and recognition from Folkworks at Sage Gateshead. It has been great to see our youngsters progressing to the Folkworks Summer School in Durham and audition for Sage’s youth ensemble, Folkestra. Our young people are now developing their own practices as folk musicians, singers and dancers – perhaps, in the future, the circle will turn and one or two may come back to work with us as tutors. I am convinced that the M@HoT model is replicable elsewhere, especially for those prepared to look outside the box for funding; who are able to forge similarly strong partnerships, and attract support from committed parents and volunteers. If a non-musician like me can take an active role in running a project like this, surely anybody similarly interested – preferably actual folk musicians – could do the same. Funding opportunities for similar projects are provided through the Heritage Lottery Fund and the Arts Council, including their new joint Great Places scheme, and their helpful staff can talk you through the application process.